"Tech Entrepreneurs Willing to Change the World" Malaga, Spain - MENA Alliances Group Inc.
During September 2016, the CEO of MENA Alliances participated as a speaker in a session entitled, “Tech Entrepreneurs Willing to Change the World” at EmodeaLIVE 2016 in Malaga, Spain. 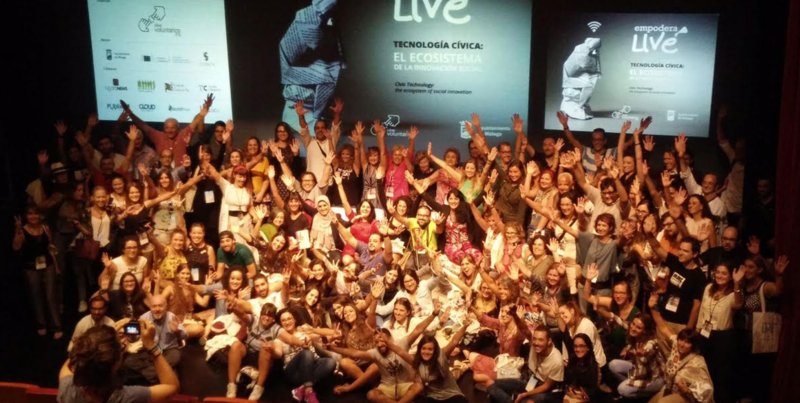 EmoderaLIVE 2016 focused on civic technology as an engine for social change and the role of brave, entrepreneurial women, promoters of this change worldwide. During the conference, Abeer Abu Ghaith talked about MENA Alliances and how it focused on promoting opportunities for women and youth in Palestine and the Middle East by connecting them with the global market through offering online jobs and training. Abu Ghaith talked about facing challenges such as Israeli occupation, social and cultural challenges. She also explained how she used technology to overcome these challenges and help others through her company business model. EmpoderaLIVE is an international symposium about social innovation that has received the participation of personalities like Jack Dorsay (co-founder of Twitter) and David Kobia (cofounder of Ushahidi).